India is one of the few spacefaring nations having demonstrated capability in both launch vehicle and satellite domains. The Indian Space Research Organisation (ISRO) functioning under the Department of Space is the responsible agency and has established the capability to plan and implement end-to end missions. The main thrust of ISRO is aimed at carrying out satellite-based applications for societal benefits. These include satellite missions for communication, earth observation, meteorology and regional navigation. ISRO also carries out scientific missions, deep space missions and offers commercial launch services. Technology improvements have been steadily incorporated and in the earth observation satellites, better than one metre resolution has been achieved. Because of the dual use nature of space applications, the security services in the country have derived information useful their purpose from the ISRO space programmes. Among the launch vehicles, the Polar Satellite Launch Vehicle (PSLV) is operational and has a good track record. The Geosynchronous Launch Vehicle (GSLV) should also be reaching operational status shortly and while the GSLV Mk-3 is still in the development stage. ISRO is a civilian organisation and very rightly prioritizes its mandated tasks. Consequently, the space services currently do not cater to the needs of military space, which are evolving now. Though ISRO has the technical capability, there are capacity constraints in both satellite building and launch services. Envisaged military space requirements will include exclusive communication satellites, electronic intelligence satellites (ELINT) and constellation of optical and radar imaging satellites for continuous intelligence, surveillance and reconnaissance (ISR) activities. Small satellites are playing an important role in space applications. They are faster to build, are cost effective and better as they benefit from the use of latest technologies. Small satellite platforms can be adapted for military missions involving optical and radar imaging applications with good resolution as also for ELINT operations. Many examples of international practices bear this out. For increasing the launch frequency, a small satellite launch vehicle can be configured using stages of the Agni missiles and/or ISRO solid rocket stages. Such a launch vehicle would be capable of placing a satellite of mass 350 kg in a nearly circular 500 km polar orbit – quite adequate for military space missions. 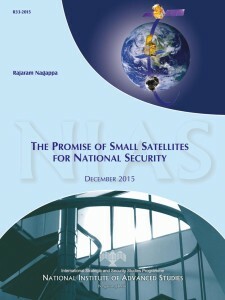 The report surveys the small satellite capabilities to meet military space requirement. Use of available standard small satellite buses is suggested to cut down the development time. Major involvement of industry in both satellite and small launch vehicle realization and integration services is suggested to overcome the capacity constraint. It is also suggested that advantage be taken of mobility and different launch locations to carry out the flight missions.